This post has been sponsored by At Home, but the opinions expressed are 100% my own. Finally, we are enjoying cooler weather, here, in Kentucky. How about in your neck of the woods? Last week, I took advantage of the crisp fall temps and finished much of the outdoor decorating. 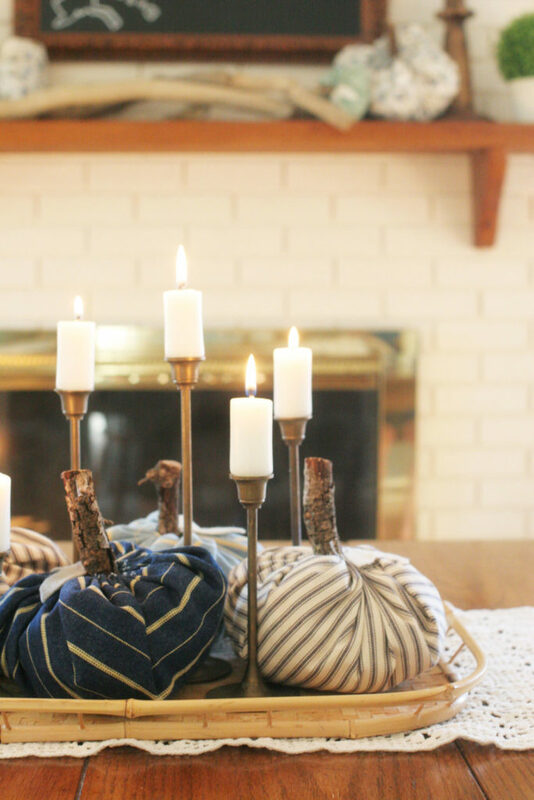 Now, our home is full of rustic and natural fall home decor… and I can’t wait to share it with you! 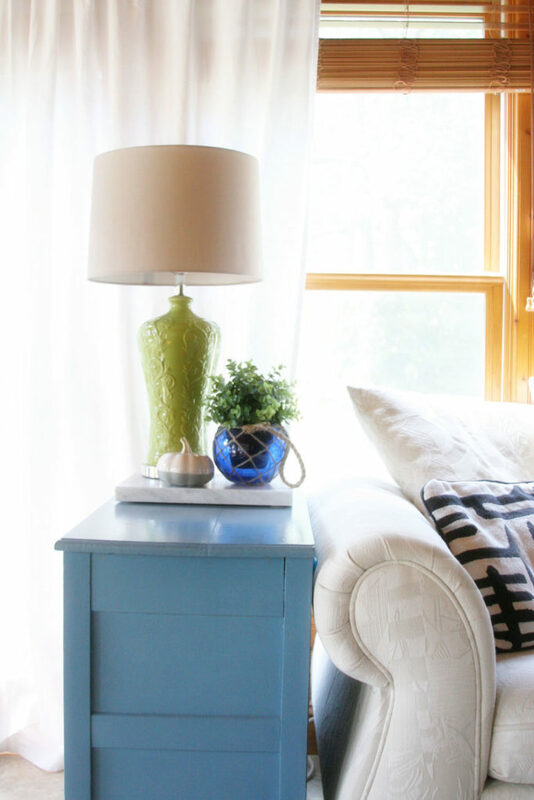 Plus, there are 8 other home tours to check out at the end of this post. You all must pop over to see the DIY Magnolia Wreath hanging on our front door — compare how it looked two weeks ago versus how it looks now. The leaves have dried into a muted green and the edges of the leaves have curled inward, similar to the trees in our backyard that will be changing throughout the fall season. 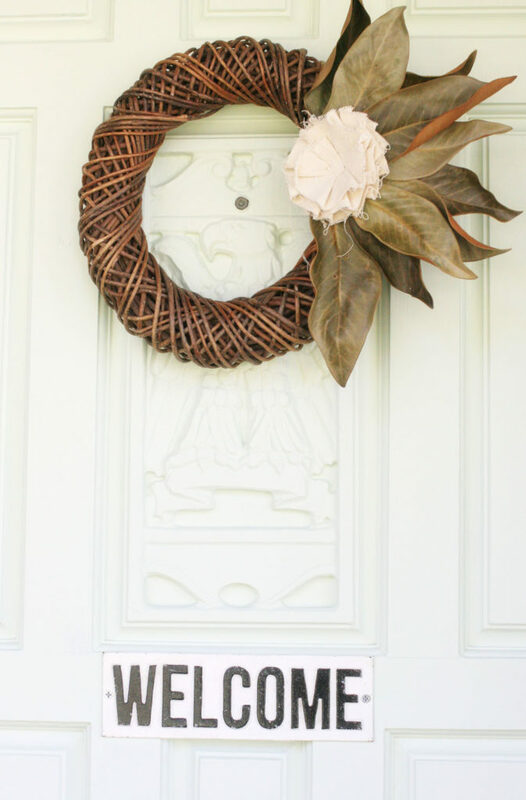 This simple wreath set the tone for our fall decorating. I paired natural items like branches, pinecones, and pumpkins with earth-tone colors and rustic textures. Unlike the summer tour, which was full of rich color, our fall home tour feels quiet, warm, and cozy. 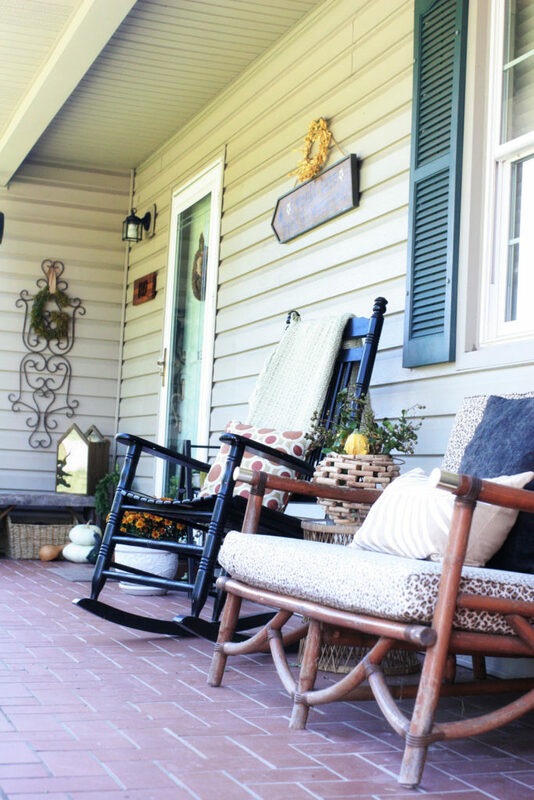 Our long front porch is anchored with a seating area. Two black rocking chairs flank a loveseat, typically softened with palm leaf fabric pillows. However, palm leaves don’t really fit the autumn vibe. 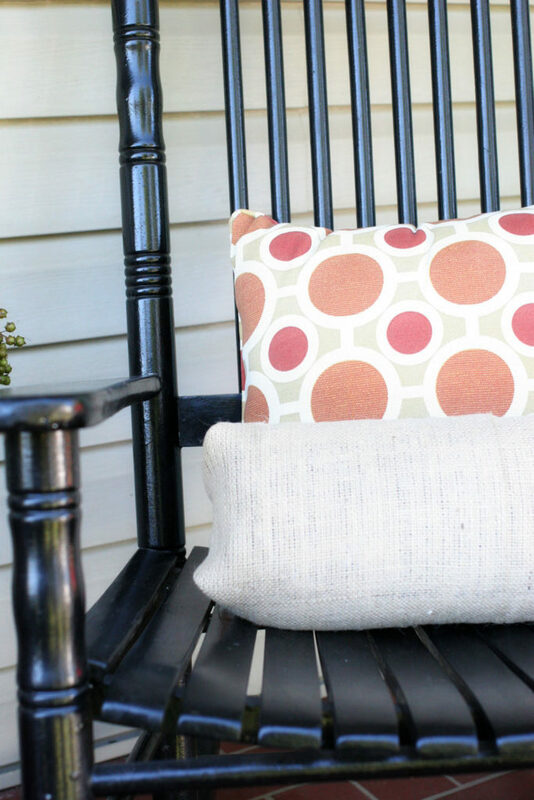 So, I switched out the summery pillows for fall colors and burlap texture. My rule of thumb for pillow shopping is to purchase covers — not entire pillows — because covers are easy to fold and store. I tossed a knit throw over one of the rocking chairs to add cozy texture. 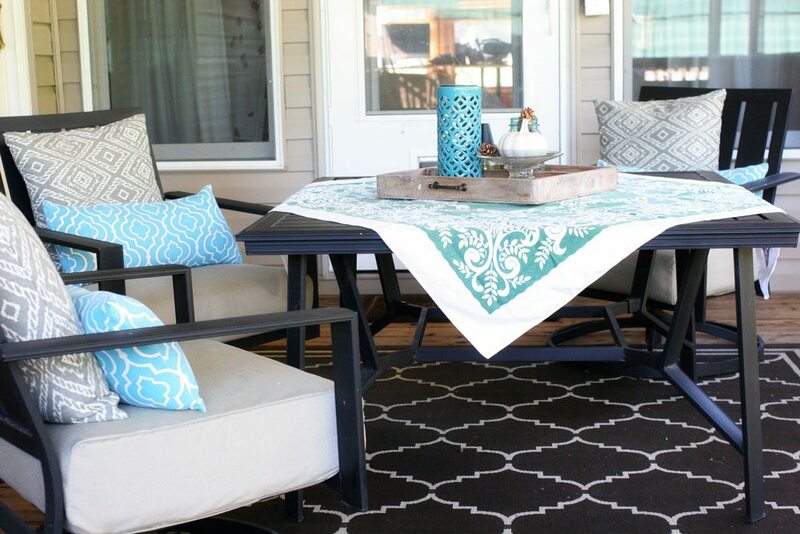 Textiles are one of the most inexpensive ways to decorate for the seasons. This blanket is typically on the back of a chair in our entry way but I brought it outside for cool, fall evenings. I picked up a gorgeous driftwood lantern from At Home and filled it with clipped branches and bright gourds. 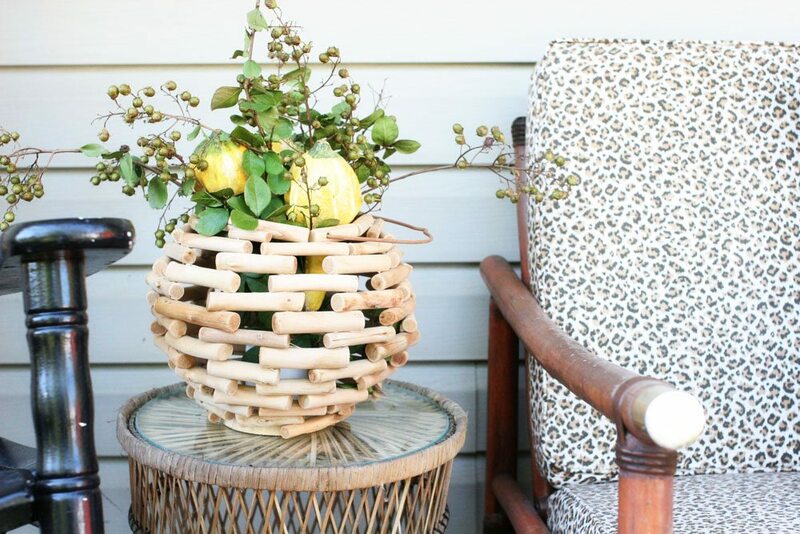 It’s a floral and fruit bouquet, perfectly placed on a wicker side table set between the loveseat and rocking chair. At the other end of the loveseat is a large demijohn bottle, also filled with branches. Take a walk around your yard and find natural elements to use in fall decorating. At the other end of the porch, I keep a rustic barn wood bench. It sits left of the door as a spot to slip on shoes. A collection of Mums, succulents, pumpkins, and gourds fill the space. No fall porch is complete without a visit to the local gardening center for an array of colorful pumpkins and Mums. Layer natural elements and don’t worry much about matching. I’ve set a stained wood lantern from At Home atop a gray-toned barn wood bench and wicker basket. A mix of woods, textures, and neutral tones is a reflection of what we actually find in nature, making this autumn vignette warm and organic. If you’ve read my blog long, you’ve seen the dining cabinet many times — most recently in the summer tour. For fall, I removed the blue accents in favor of a neutral color palette. 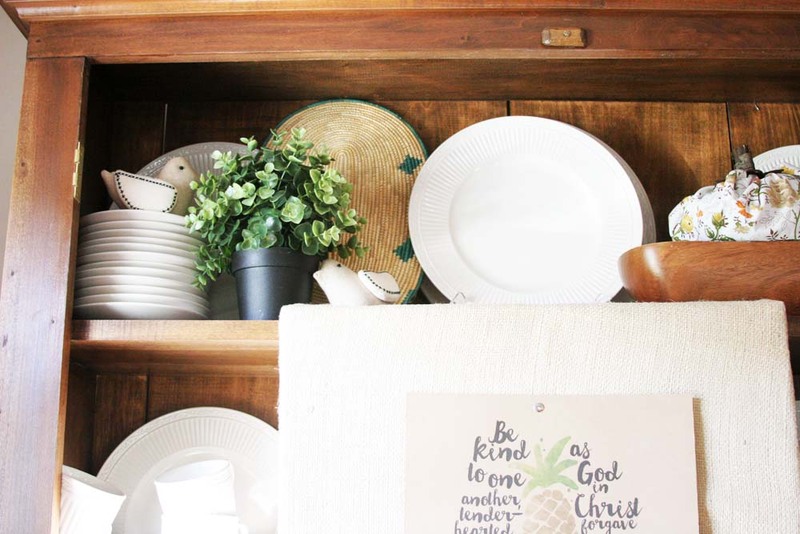 A set of woven placemats tucked in around the white china was a simple solution to add warmth and texture. 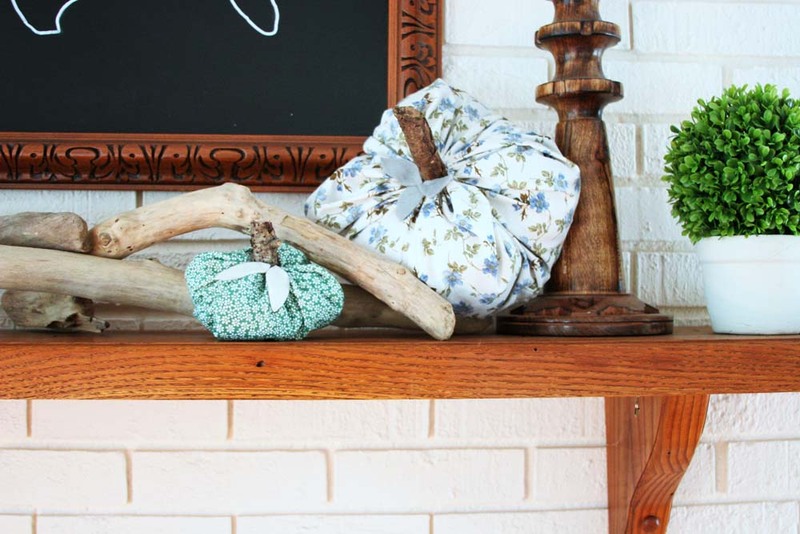 The dining room cabinet, mantel, and table are each home to fabric pumpkins, mixed in with other natural elements like driftwood and succulents. 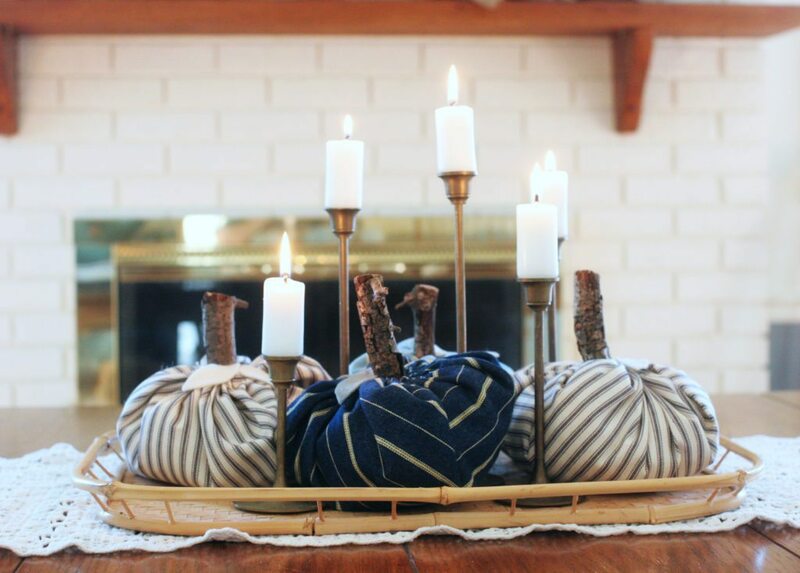 As an easy centerpiece, I filled a bamboo tray with pumpkins and brass candlesticks. Fall decorating doesn’t have to be complicated, a few simples pieces can make a big difference. In the Family Room, I wanted to pull in some warmth and texture. 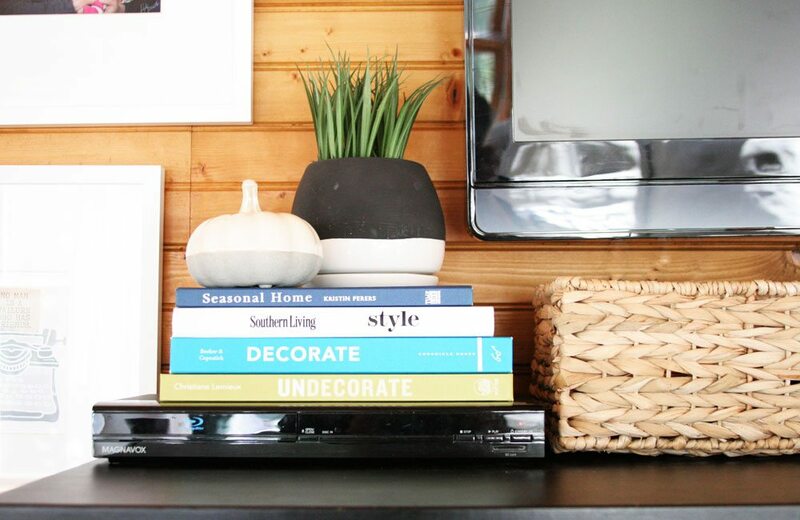 On one side of the television, I stacked books, a small ceramic pumpkin and a small faux plant atop the DVD player to camouflage it a bit. Next to the stack of books is a woven grass basket from At Home which holds remotes and phone chargers. 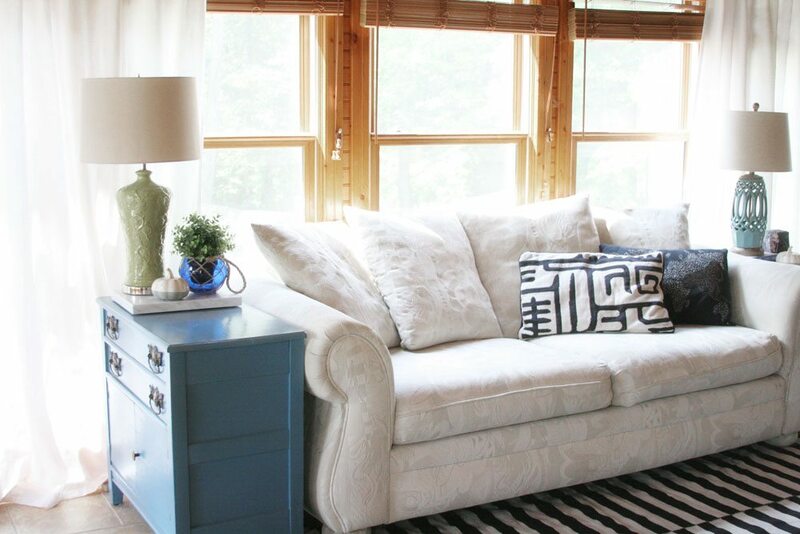 On each side of the couch are gray and white pumpkins from At Home. The small pumpkins give a simple nod toward autumn without decorating an entire room. I also placed a fall picture in the front of our Instagram photo holder. The heat of August has caused me to look forward to being back out on the deck during cooler weather. It seemed fitting, then, that I add some autumn warmth on the deck, too. I picked up two wreaths from At Home; a succulent wreath and boxwood wreath. The succulent wreath seemed incredibly affordable at $20 and I love how it looks hanging on the door. 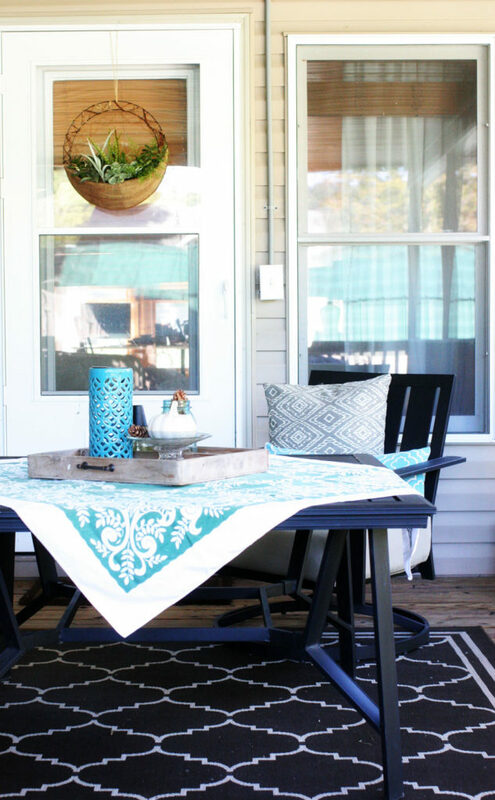 In front of the door is our patio table, covered with a deep green tablecloth which balances the summery teal tones in this space. If you don’t want to swap out the normal color palette in a space, balance it with season-appropriate colors for an autumnal feel. The boxwood wreath helps frame the space above our outdoor serving bar. 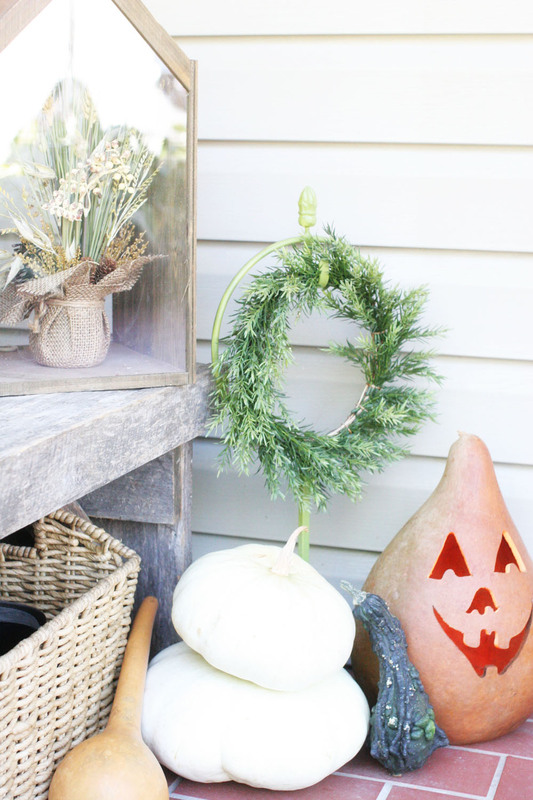 The natural wreath is paired with a ceramic pumpkin and pinecone-filled mason jar. 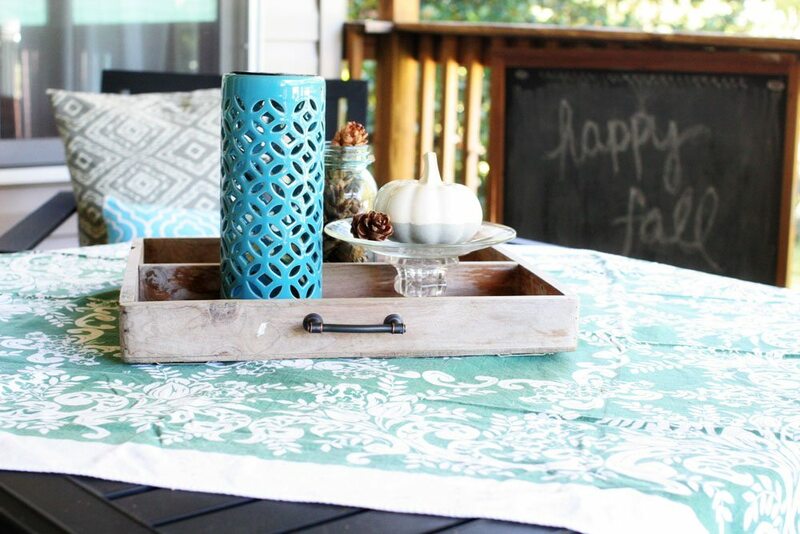 On the patio table, you’ll find more pinecones and another ceramic pumpkin on a warm, stained-wood tray. Have you done any decorating for fall? I’d love to hear about how you like your home to feel during this time of year. Thanks so much to At Home for sponsoring this Fall Home Tour Blog Hop. Our home feels warmer and cozier, filled with rustic and natural elements. 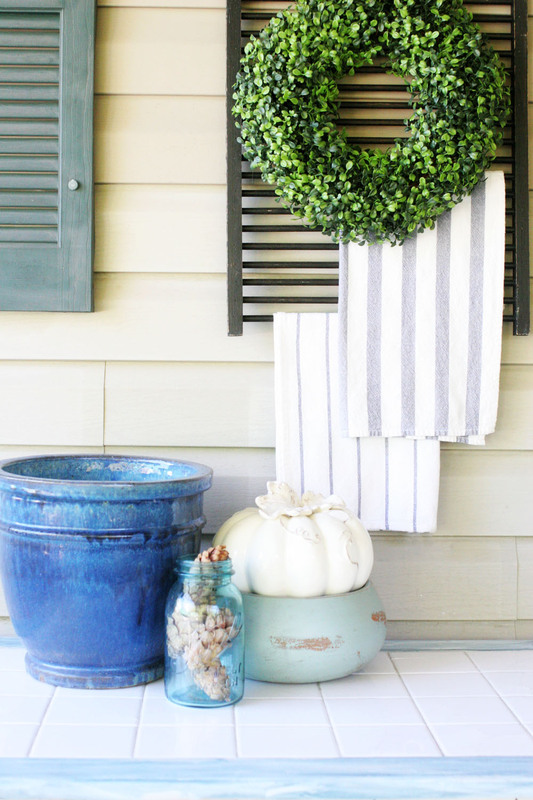 Make sure to visit the rest of the homes for more fall decorating ideas. Your front porch is so wonderful and welcoming. The wreath, the sitting area and all the little fall touches are simply beautiful. Your inside is beautiful as well with all the fall accents. I love the fabric pumpkins. 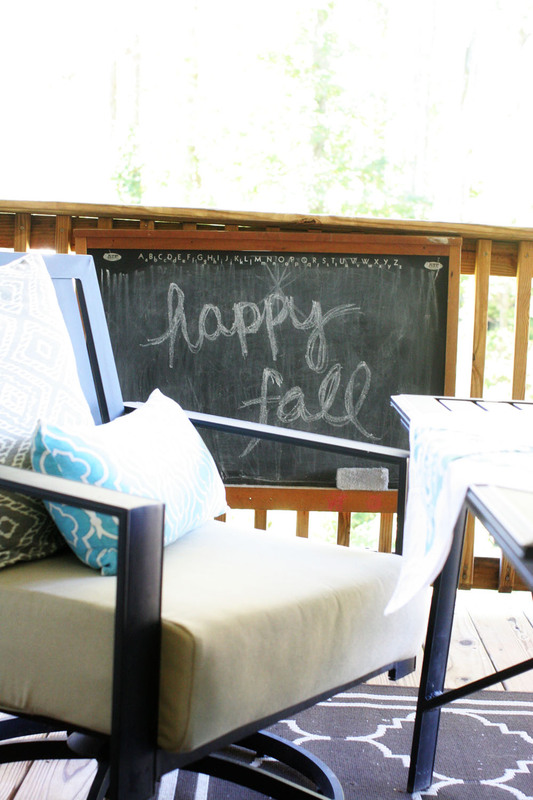 It’s so much fun participating in this fall home tour with you and the other fab bloggers. I love all of your decor. Looks so great Lora! So warm and cozy! The wreath looks beautiful with the leaves changing color and texture. I love everything you’ve shown! I wish I had a front porch like that. I love those little gray and white pumpkins! So simple, yet so elegant! Your home is beautiful! Thanks, Kristen! Aren’t they cute? Simple and sweet! Oh I love the flower pot and fabric pumpkins, what a great idea! Everything about this is my style! I love it! It looks really warm and welcoming. You have such great taste for how you decorate. Thanks for all the wonderful tips of how to add to what you already have. 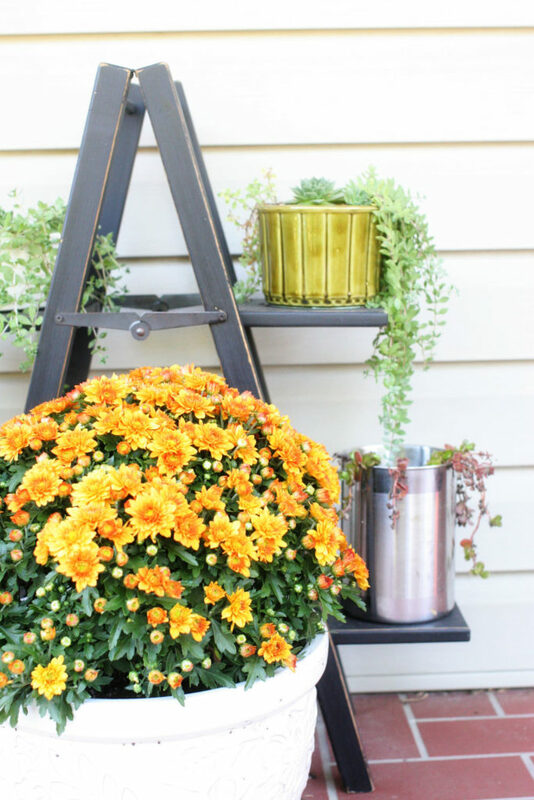 Beautiful and I agree, a Fall porch’s got to have some mums and pumpkins. Also, the magnolia leaved are gorgeous now that they have dried. Thanks, Zan 🙂 You are always so sweet!! Your home is so warm and inviting! I think I like the magnolia wreath more now that the leaves have dried. So pretty! Great tip about buying pillow covers instead of a whole new pillow, never though of that and it would definitely save money! Your front porch is my favorite – the mums and that ladder!! It’s perfectly fall. I think I like it better with the dry leaves, too — especially for fall! 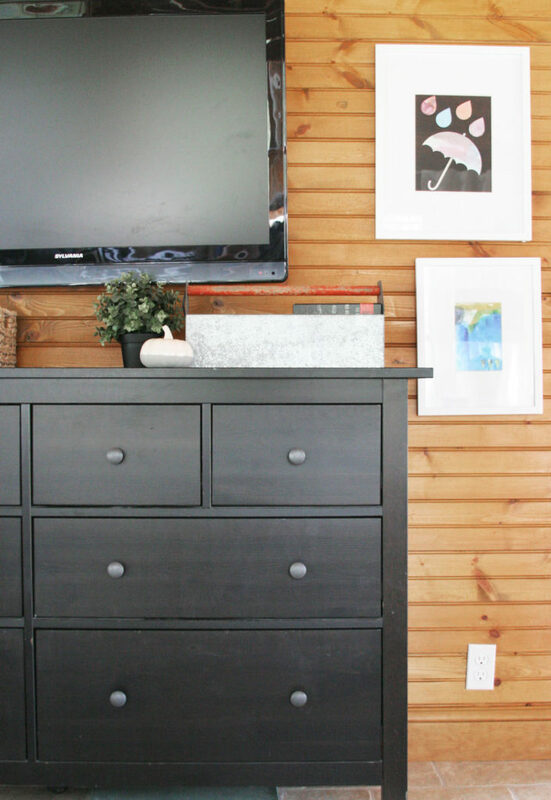 Oh my goodness, I can’t get enough of your home Lora! It makes me wish I could come visit. I could just stare at your pictures forever, trying to drum up some inspiration for my own home. Yours is just beautiful! After seeing your wonderful porch, I don’t think I would ever make it past your front door. I would just sit in thos great chairs and not go any farther.. ha. Gorgeous! I just love all of the touches you’ve added. That driftwood lantern as a planter is so cool. I also love those fabric pumpkins. 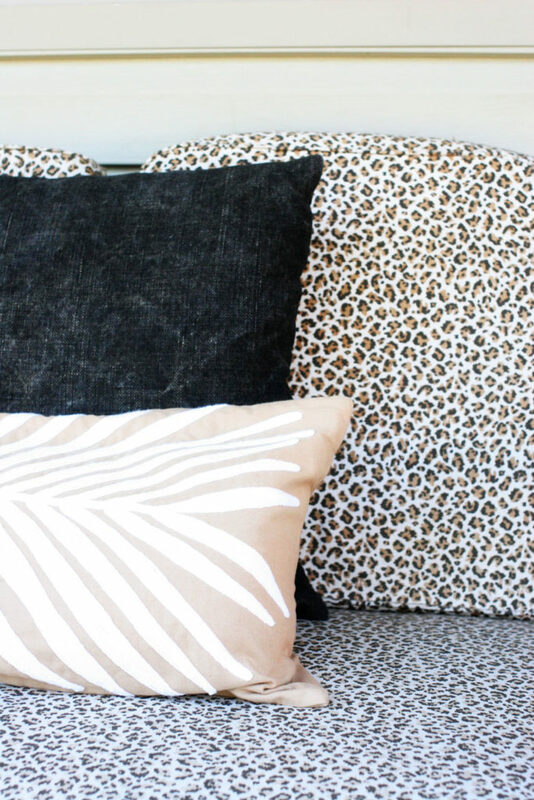 Great idea about just purchasing pillow covers instead of the whole thing…storage is so important. I want to hang out on that lovely porch under a cozy blanket while I drink pumpkin spice tea. Me, too 🙂 Sounds like a lovely afternoon! Wow, what a gorgeous home! Thank you for the tour and for the inspiration! 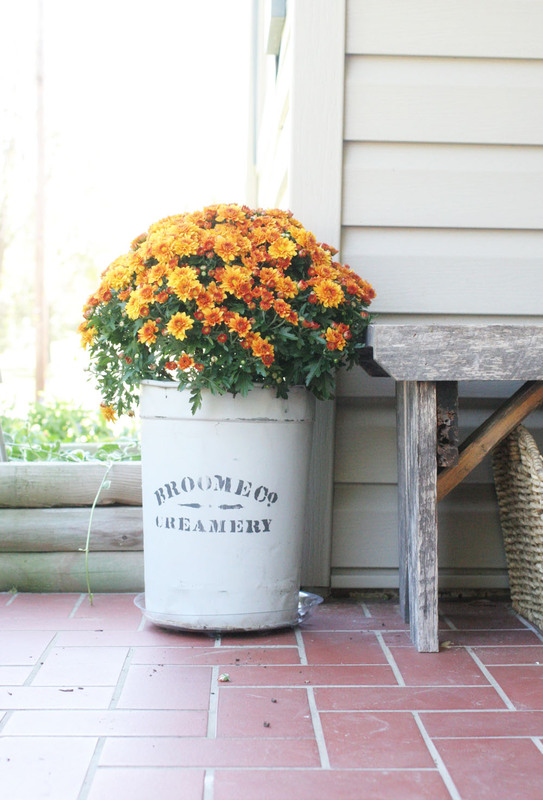 Love all the plants on the front porch….I haven’t gotten mums the past few years; I might have to finally pick some up again this year! 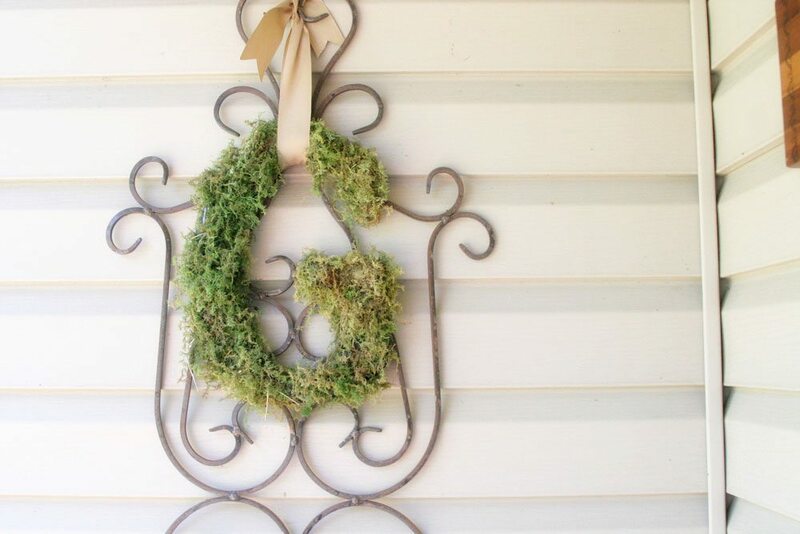 I love the fall wreath! Your house is perfect. So dreamy and perfect for fall! Love all of these ideas! So warm and welcoming! I’m obsessed with all your decor! Everything looks beautiful, especially the wreath! I want to have a big mug of coffee on that front porch! Love the whole look of this. 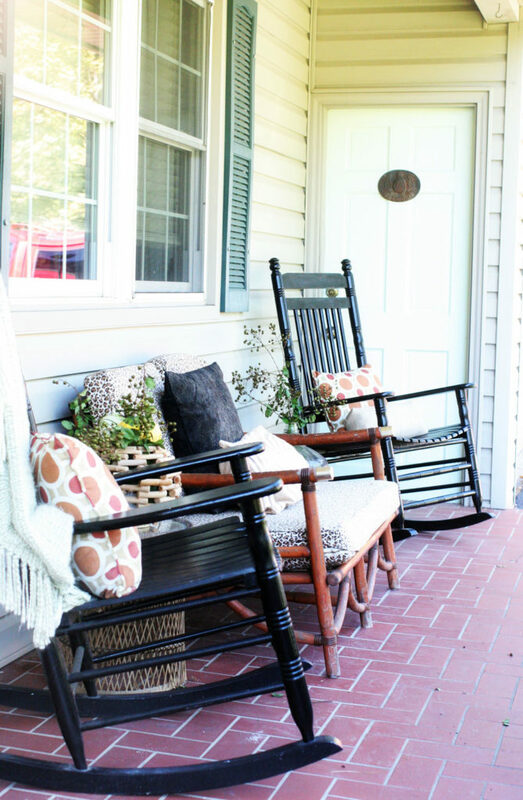 Oh, I’m so jealous of your front porch! We have a fairly small cement porch (which I’m grateful for) but I’d love to have something a little larger and more inviting. 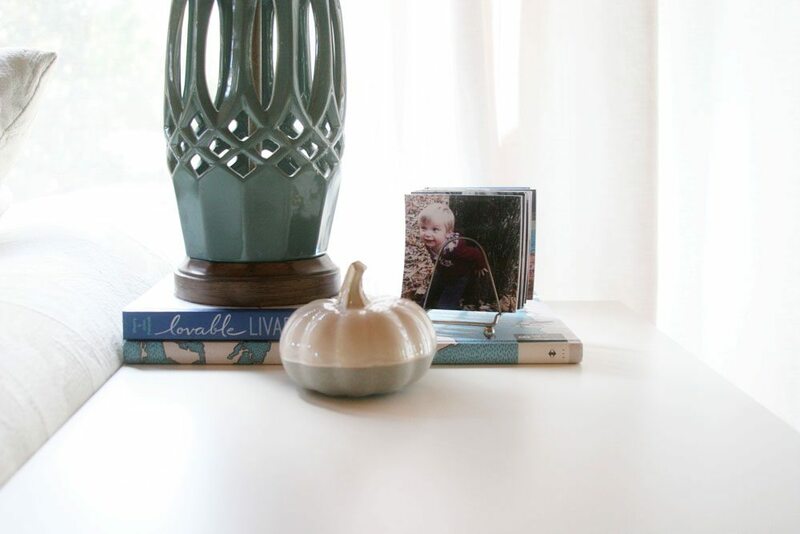 I love all the little fall elements you scattered around your home and your tips for decorating. Thanks, Shani! 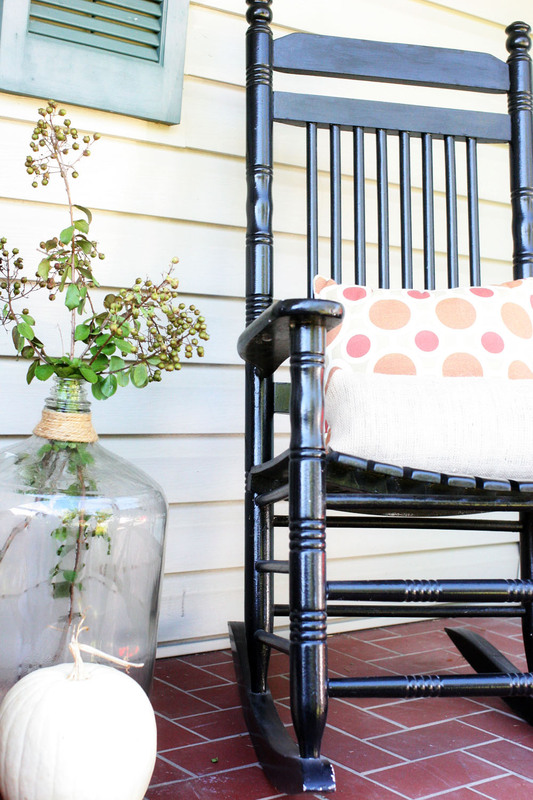 Yes, the front porch is wonderful — our last home had a small porch, so it’s been fun to really embrace this space! Love these ideas and such great tips!! That’s such a good idea to get pillow covers instead of thousands of pillows lol. 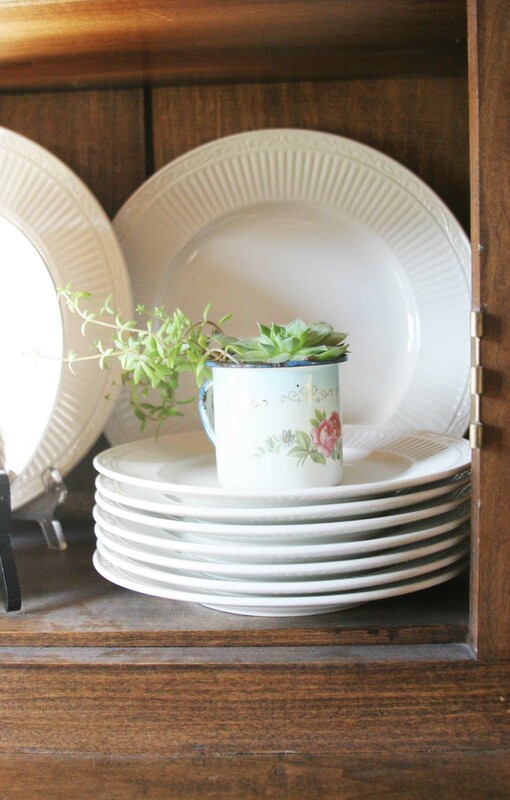 So much more functional and LOVE your center piece for your dining table. Beautiful home and fall touches! Love all the colors and accessories you used.